Before you proceed reading further, let me tell you exactly what this is about. This is about all you people who made it to the NLU’s and also about all of those who didn’t. This isn’t a story about how amazing Law Universities are. It’s about the people, not the places. Now that I have generated enough curiosity and confusion in your mind to be sure that you will read the entire thing before judging, let me begin. So, you fought with the demon called CLAT and made it into a NLU? Good job! You must be on top of cloud 9, right? You must already be thinking how you’re the next CJI or maybe Salve. NEWS FLASH: - You are nothing right now. I am sorry, let me re-phrase it. You are nothing unless you prove otherwise. Let this sink in. Now let me tell you why. And the reason is so simple after I am done explaining even you would admit that I am right. Getting into an NLU doesn’t make you great. Cracking CLAT doesn’t mean that you are the God of Law (Sorry folks, I know it might come as a shock to a few of you, but the tons you learn in your CLAT coaching classes, isn’t enough to even help you pass first year.) . I have met more people than I care to remember who cracked CLAT and made it to one of the top NLU’s without the slightest idea as to the difference between the Bar and the Bench. I refuse to go into a discussion as to how ‘difficult’ CLAT is (Anyone who has given CLAT or compared the different years papers would get my hint.). The point here is that, if you really think you are amazing just because you passed CLAT, you wouldn’t need college, would you? Something similar needs to be noted by the so called non- NLU law students. Just cause you are not in the top law college of the country doesnt mean that you get the right to whine about the lack of opportunities. Yes, it might a a minor setback, but in the legal world if you are really good enough, you can always find opportunities for yourself. Being a student of a non-NLU student is not an excuse for not working hard enough to get opportunities. Ultimately it doesnt matter where you come from, what matters is where you intend to reach. If you try hard enough you will succeed. Never blame the situations for your failure, cause the situations are more often than not, a direct or indirect result of your own actions. All NLU students kindly consider this, only 2-5 % of every batch to pass out of a Law School is considered its “cream.” But you might say, “Hey, what the hell? I am a NLU pass-out. I deserve to be picked by a Law firm before all the other riff-raff from other colleges.” Being in a NLU doesn’t make you special or great. There are over a thousand of students passing out from all the different NLU’s all over India. At the best, a mere 50 law students would shine extraordinarily each year, maybe even less. And guess what, all those 50 students won’t be just from the NLUs. While it is true that there are more success stories in NLUs than other law schools, these credit for those success stories goes to the students alone. A lot of students lose the potential they initially had when they make it to any college, that is when they let their ego and prides get into their head. The reason why NLISU, NALSAR, WBNUJS are deemed so highly even among NLUs, is not cause whoever makes it there is amazing. It is because these colleges shine, shape and give you all the opportunities that a student might need to outshine. But that doesn’t mean that you will shine. The colleges work is to shine. Whether you are a diamond or mere rock is for you to decide. So let me summarize what I am going on about for all those who didn’t pick up the hint yet. Law colleges are amazing, but just because you are in one doesn’t mean you are amazing. Getting into a top law college doesn’t make you special. Surviving it does. Surviving doesn’t mean merely passing the 5 years. No, that would be called escaping. Surviving means understanding the complex, ever evolving world of law and adapting yourself to it. Look at it like this, Law is like a dangerous jungle safari. The colleges are those guides who instruct you on methods of survival in the wild. The top NLUs would be those experienced guides who would provide you with the latest high-tech resource. A new unknown college would mean you need to be more determined and put more effort than others in your line. But just because you have the resources at your disposal doesn’t guarantee their proper use, does it? This is where my point lies. How you use your resources depends on the individual. 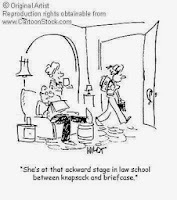 Any Law school can tell you what will be the best and the worst case scenario. They won’t help you when things turn bad in the real world. The fact is that in the long run it doesnt matter which law school you are from. It is you who should be special to begin with. Similarly, those not in NLU’s should sit and cry about the lack of opportunities. 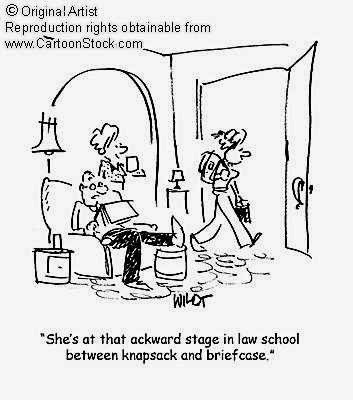 In Law School, there is nothing called lack of opportunities. NLU or not, if you are good enough, you will make it. In this respect Law is a lot like mathematics. You either understand it, or you don’t, you can’t be forced to learn it, irrespective of whether you are in NLUJ, GLC or SOL Christ University. Out there in the real world, where you come from isn’t as important as what you can do. It is not about your college, it is about what you have done in that 5 year except just passing your subjects. It should be noted that the writer has no problem whatsoever with NLU’s or other colleges. This writing is merely a satire. A dark humor aimed at Law students anywhere who initially deem themselves above rest of human race simply because we are in a Law School.